Learn how to install a thermostat with programmable features and you'll be able to more effectively control your home's heating and cooling costs. Before installing a programmable thermostat, it's important to realize that these devices are not mix-and-match. The thermostat you will be installing has to be able to communicate with your furnace, so choosing the right one is the first step in this relatively easy job. There are also three different types of thermostat systems used by these heating systems, including line voltage, low voltage and millivoltage. Since millivoltage is very rarely used in a residence, line voltage and low voltage are the two primary types found in the home, with low voltage being the more common of the two. Low voltage programmable thermostats incorporate a step-down transformer to decrease the operating voltage from 120-volts to 6-volts, 24-volts or 30-volts, with 24-volts being the most common. This type of thermostat is used on most gas furnace systems in the United States and will have a series of very thin, multi-colored wires attached to it. Line voltage thermostats are powered by a 120-volt or 240-volt circuit, depending on the heater and these are primarily found on electric resistance heating systems, like that used by electric baseboard heat. This type of thermostat has thicker wires, like those used throughout your home. For the purpose of this article, the instructions included are for how to install a thermostat that's powered by low-voltage. Whether your thermostat is being powered by 24-volts or 240-volts, the most important step when installing a new one is turning off the circuit that powers it. The power is controlled by a circuit breaker or fuse in the home's electrical service panel. Find the correct breaker and turn it off or remove the fuse if you have an older system. Remove the existing thermostat from the wall and either take a digital photograph of the wiring connections or draw a schematic of them so you will have a better idea of where each wire gets connected to the new thermostat. If the wires are not of the multi-colored variety, label them with tape so you know which terminal they each get connected to. Remove the old thermostat mounting plate from the wall. Disconnect the wires from the thermostat and wrap them around a pencil to prevent them from falling back into the wall. Slip the new thermostat's mounting plate over the pencil and wires and position it over the spot where the wires come out of the wall. Use a torpedo level to ensure the plate is level and mark the spots where the screws will be used to fasten it to the wall. Install the screws and double check that the mounting plate is level prior to tightening them down. Connect the wires to the terminals on the new thermostat according to your photo, schematic or labels. Once they're each connected and secure, push the excess wire back into the hole and snap the thermostat in place on the mounting bracket. If the thermostat requires a battery, install it and turn the power back on to the circuit. 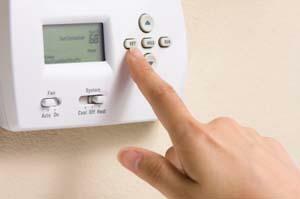 Test your new thermostat installation by running the air conditioning or furnace. Program your new thermostat according to the manufacturer's directions and by following Energy Star's heating and cooling recommendations; your home will be more comfortable than ever and your utility bills will be as low as possible.